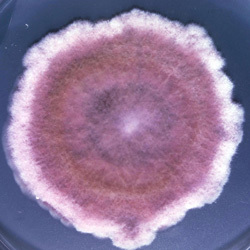 Fusarium is the name given to a whole host of different molds. While there are currently 1,000 identified different species of Fusarium, the bulk of them are harmless…at least to humans. You still wouldn’t want to get any of the species in your home, though. Fusarium is incredible ‘fast growing’ mold, and not only can it look unsightly, but it can cause severe structural damage. Fusarium comprises over 70 species worldwide. It grows in soil, plants, and grains. Because it requires wet conditions, often you’ll find Fusarium growing in humidifiers indoors. 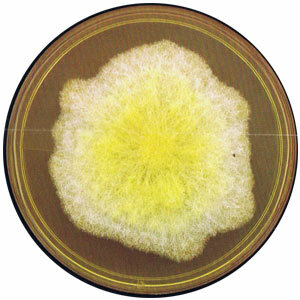 The texture of its colonies varies from flat to wooly or cottony and its colour ranges from white, tan and salmon to cinnamon, yellow, red-violet, pink or purple. The bulk of the species of Fusarium are not even found in the home. For example; one of the most prevalent species in this country is Fusarium graminerarum, which impacts barley crops. In fact, a particularly bad outbreak in the US between 1991 and 1996 killed over $3 billion worth of crops. We are still in the process of recovering from it. Not all Fusarium is bad, though. If you are a vegetarian or vegan, then it is likely you will have eaten Fusarium at some point. Fusarium venenatum, or Quorn as it is more commonly marketed as (a much more palatable name), is often included in many different foods. Fusarium is a keen lover of damp areas, and you can bet your bottom dollar if you do not eradicate damp in your home, then the prevalence of Fusarium means that it is going to pop up sooner as opposed to later. Where can Fusarium mold be found? If there is a damp spot, then Fusarium mold is going to love it. It is most commonly found outside, namely around crops and the like, but it can find its way into the home on occasion too. It easily spreads, with spores traveling through the air with ease. Since most of us are never going to be that far from a Fusarium mold growth, it is easy for the spores to latch on and start to spread themselves. If that wasn’t scary enough, Fusarium mold can also grow on a person. 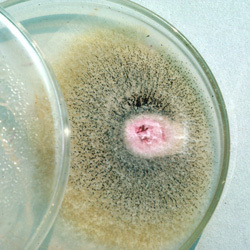 Many skin conditions and bone and joint infections can be tied to certain Fusarium molds. You are going to need a doctor for those, though. Not a mold removal expert like us! Let’s start with how Fusarium impacts plants and crops because it is a very common problem in the United States and Canada. It causes a lot of damage each and every year. 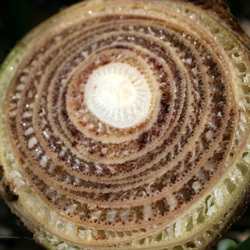 This condition is known as Fusarium wilt. It normally attacks potatoes, peppers, and tomatoes. The soil pathogen, known as Fusarium Oxysporum is tricky to spot too. This is because when it does impact the plants, it tends to be later in the season. This means that you can’t really replace ethe plant, so if you have an infection, then your entire crop will have been destroyed. Fusarium disease causes the plants to wilt. This is because it blocks the vessels in the plant’s roots which absorb water. The mold will spread up the plant, taking up every bit of water that it can, which effectively dehydrates the plant, killing it. Most farmers will not spot the disease until their plants have turned yellow. This is not just going to impact farmers, though. They take so many precautions against it that the problem is fairly minimal. However, if you have a garden at home, you probably are not checking for Fusarium Oxysporum on your own, which means your entire garden can be killed with a particularly bad infestation. How does Fusarium mold impact humans? For many, there will be no impact from the Fusarium mold. It looks unsightly, but they do not get sick from it. However, other people may have a more serious health symptoms to this mold. Fusarium is a known allergen. Remember that Quorn mentioned earlier? There are some people who can never east that as it could be deadly for them. Allergy symptoms are much the same as other allergies. This means fever and asthma caused by the mold. You can develop allergies to Fusarium molds too. Many people who have suffered prolonged exposure to the mold have reported this. If some get on your body, then it could lead to severe eye, skin and nail infections. The are some species of Fusarium which could also be deadly. In rare cases, the mycotoxins produced by the Fusarium could get into your body and impact your circulatory or nervous system. It could cause permanent damage or even death. Since you will never know what type of fusarium you are dealing with in your home, it is always wise to call an expert. Obviously, if you feel that you have had a reaction triggered by mold in your home, then you should talk to your doctor as soon as possible. A lot of the damage caused by the mold will be due to prolonged exposure, so the quicker the treatment, the better. There are several prescription products on the market that will help you out. Many of them are lipids which will be applied directly to the skin. How do you know you have fusarium mold in your home? It can be tricky to tell. Fusarium mold appears as a black mold (in most cases), however, this does not necessarily mean that the mold that you have spotted is Fusarium. It can be a whole host of different types of molds, some of them a whole lot more dangerous than Fusarium, and the only way to truly identify what the mold is will be to call an expert. Even though Fusarium mold is not always going to be dangerous to you, it will always be dangerous to your property. If you spot any type of mold in your home, then it is important that you call somebody as soon as possible. Cleaning it off the walls is not going to be enough. All it takes is a few spores left behind and you will be right back where you started. You can’t really delay the treatment, either. If you delay the treatment, then this fast-growing mold is going to quickly spread through your property, causing severe damage. As with most problems, it would be better if you ‘nipped them in the bud’ long before they actually become a problem. Any Fusarium growth on your property can easily be removed by a mold removal expert. Contact us today to find out more. We provide professional mold testing and mold removal services.